The Chi-Athlete: I've Been Thinking. 1. It warmed up! But I don't expect it to stay over 20*F for very long. 3. And #RUNHAPPY I shall! 4. Harry's birthday was last Friday, the day after Thanksgiving. I feel bad for anyone whose birthday is that close to a major holiday, since your day might very well go on the back burner just a tad. My parents and I took him out to eat for some chicken-fried steak, something I haven't been able to successfully find in the Chi! Mmmmmmmmmmm...Salt Grass's Shiner Bock bread, chicken-fried steak, and garlic mashed potatoes. Happy on a plate. 6. Oh yeah! It's about THAT TIME! I have made homemade peppermint bark, and I believe Harry would like for me to make some (very) soon. Until then, these will do. These will do very well. 7. Lolo Jones is my most favorite human. Ever. Of all time. 8. 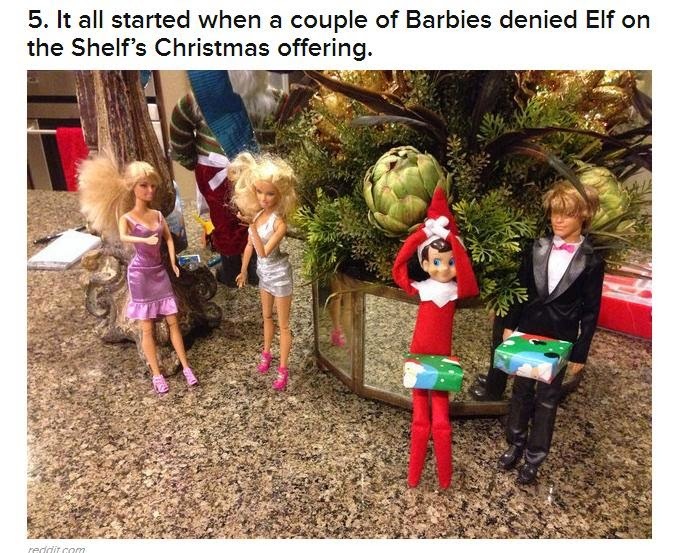 Are you doing Elf on the Shelf? Do you find it as creepy as I do? Here's something that'll address and confirm the creepiness. 9. In related thoughts (more on the Christmas side -- not so much on the creepy side), we get to put up the tree this weekend with Sophia! We had a very basic setup last year, as it was our very first Christmas together, and we didn't have a ton of cash to spend on decorations. We made our own stockings. :) We have new ones this year, but I definitely saved these. 10. My favorite Christmas song. Or at least one of them. I'm a pretty big fan of Christmas, so I might very well post my faves every Thursday. Y'all have a fantastic Thursday! Try not to think out TOO loud (like me). QUICK: FAVORITE (Christmastime) candy or sweet? Have you already put up your tree? Hahaha I love that shirt! It'd be perfect because it takes me forever to get out of bed now that I'm further along in my pregnancy & feeling quite huge. hahaha, I love that shirt! I hope you recover soon! I hate being sick, as it tends to sap all the appetite and energy out of me. I miss working out the most then too! Random thoughts: I always feel better sinus wise after I run. Elf on the Shelf creeps me out. I don't think Chicken Fried Steak exists north of the Mason Dixon Line. I'm coming over and taking all of your peppermint bark. I need to run outside this weekend while I still can. Reply to random thoughts: Me too! Me too. :\ I don't think so, either! :( OKAY! :) Let's go! This year, my son's birthday was on Thanksgiving. (The year he was born, I was in the hospital on Thanksgiving). Mine is right next to Halloween. My sister's is right next to Christmas. So. We're sort of used to it. Cheese and rice. At what point do you just ignore the holiday?